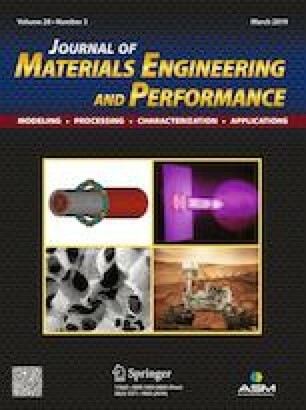 New results about the wear resistance of CoB-Co2B coatings under dry sliding conditions were estimated in this work. The cobalt boride coatings were developed at the surface of the ASTM F1537 alloy by means of the powder-pack boriding process using two experimental conditions: 1223 K with 6 h of exposure and 1273 K with 10 h of exposure. Before the sliding wear tests, Vickers depth-sensing microindentation tests were conducted on the cross section of the cobalt boride coatings to estimate the distribution of hardness, Young’s modulus, and residual stresses. Otherwise, the sliding wear tests were performed on both boriding conditions and on the untreated material, using a ball-on-flat configuration comprised of an alumina ball as a counterpart with applied loads between 5 and 20 N. The wear rates of the borided ASTM F1537 alloy were ranged between 4.02 and 8.91 × 10−6 mm3 N−1 m−1 compared with the values of the untreated material (13.90 and 15.78 × 10−6 mm3 N−1 m−1) for the overall set of experimental conditions; nevertheless, the influence of boriding conditions (1273 K with 10 h of exposure) tended to increase the CoB coating thickness, developing a more brittle layer that decreased the sliding wear resistance at the surface of the borided ASTM F1537 alloy. Finally, the presence of failure mechanisms on the surface of the wear tracks was analyzed for both borided ASTM F1537 alloy and untreated material. This work was supported by the research Grant 20195029 of the Instituto Politécnico Nacional of Mexico.